Pablo Casals, one of the great cellists of the twentieth century, never missed daily practice with his instrument for decades. One day someone asked him, "Señor Casals, you're ninety-three years old and you still practice everyday for three hours. Why do you do it?" "Well," said the maestro, "I think I'm still seeing some improvement." Has anyone considered the martial arts worthy as a lifetime pursuit? I don't mean in general or for the masses, but specifically for you. 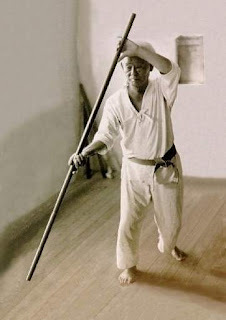 Everyone that I've known that's invested more than ten years in karate have done so mainly to teach. Without teaching, there's very little to motivate most people to train over the long haul. It is true that much can be learned from the teaching perspective, but it's not the same as training - as practice. The truth is, most instructors simply don't have time to train themselves. So if you don't fancy yourself as a teacher, what do you do? You can still train on your own, but how can you gauge your own progress? You may think that the master can be the only reliable guide on the path of budo, but realize that the ultimate task of the true master is to transform the disciple into an equal. Donn Draeger once said that the trainee should practice diligently, with heart-and-soul, but should never expect anything in return from training. Why train if I don't get anything out of it? Why bother training at all then? We've all heard that saying, "Do what you love, love what you do." Certainly Pablo Casals couldn't have cared less about making improvements in his already masterful playing skill if he didn't have true passion for music in the first place. In this way the practice itself becomes the end, not the means. The way is in the training. Goal setting, while important conceptually, only begets more goals to acquire. But even that is a cryptic message. The real goal in martial arts advancement is to be process oriented. It's all here-and-now. And with that realization, all boundaries bust loose. As karate master Hohan Soken once noted, "Martial arts training has no limits." John...thank you for this. Practice is hard, and practicing alone is harder still. But for me that is the reason to practice: to meet what I find difficult in myself. Sometimes training everyday is harder than executing 100 roundhouse kicks perfectly. If that's the case, then I know what it is that I need to practice, and that is perseverance as opposed to technique. For me I practice because it raises questions. And then I live those questions. This reminds me of an interesting story (I don't know if it's true or not) about Yitzak Pearlman, the great violinist. Apparently at a post-concert party, a woman approached him saying "I would give my life to play like you do." Mr. Pearlman looked at her, and replied "Madame, I did." My motivation to train came from spending a lot of time in assisted living and nursing homes towards the end of my mother's life. I saw example after example of human train wrecks, and I wanted to do what I could to prevent a similar future for myself. I wanted to pursue an exercise that would engage me intellectually, that wouldn't require a specific location to practice or special equipment (training mats), and that would foster good balance, alignment, and so on. I don't know if ever being a teacher will be in my future, but I can see myseld continuing to practice will into my golden years. I taught for a few years and found that I trained and practiced on my own before and/or after giving guidance to students. Today tho I don't currently have any deshi I still spend a good deal of time training. I have been practicing and training for a bit over thirty years now. Happy New Year! I am commenting for the first time. I adhere to "Shoshin wo wasurebekarazu" a phrase attributed to Zeami Motokiyo (世阿弥 元清) also called Kanze Motokiyo (観世 元清), (1363 - 1443) who was a Japanese actor and playwright. Loosely translated, "Never forget the spirit of the beginner". One of my goals after attaining black belt is to teach. In high school, I frequently tutored my girlfriend in the black wizardry that Calculus sometimes is. In breaking the math down to teach it to someone else, I found that I benefited in the process--gaining a deeper understanding of the principles I'd already learned. I hope to do the same in teaching martial arts, to gain a deeper understanding of that which I am breaking down for someone else. Oh, and that girlfriend in high school? She's now my wife of nearly 20 years. There's something to be said about good study and training habits. I enjoy your blog, very insightful! As a Black Belt, I am still a student (student of Life), and though I do instruct young Karateka I am constantly in a state of training (both mentally and physically). So to answer your question, I do consider martial arts worthy as a Lifetime pursuit. I try to implement my martial arts mindset in all the facets of my life (like studying for an exam, or writing a paper I picture them as a fight I must overcome). As Bruce Lee, Musashi and all other famous martial artists say, Martial Arts should be a way of life, and just by continuing to live we are in constant training to make ourselves better people. The Balance of living our life in this fast paced society where "time is money" finding time for our physical training is (I feel) another test that we must train ourselves to overcome. May 2009 be full of positive material on this website. I still don't fully understand why I train. I often wonder why and yet keep going and end up remembering while I'm doing it. I find that sitting and thinking doesn't help much for the practice part or motivation part. I may be (finally) acquiring some wisdom. Or not. When I stop training, that will be when I stop Karate.